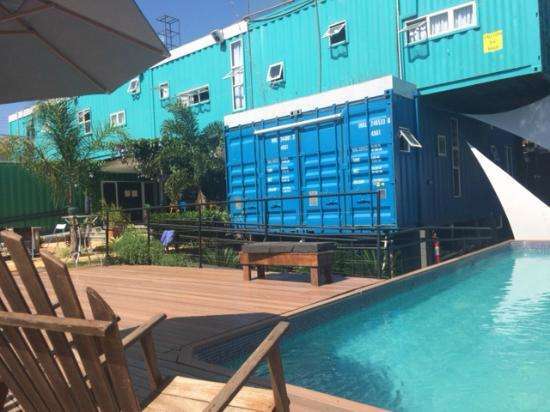 Tetris Container Property is the largest property built with shipping containers in the world, in an unique and unusual design, with a big recreation area, swimming pool, bar, chill out area, in the tourism corridor of Foz do Iguaçu. We are strategically located on the main road that connects the airport and waterfalls to the city center, with easy access to major attractions of the city. It takes just 15 minutes by taxi or 30 minutes by bus from the airport! There are many options to go out nearby: restaurants, cafes, bars, and nightspots. It is located just a few blocks from the city center, with nearby supermarkets, banks, pharmacies, etc. We offer a lovely outside area, with a swimming pool in a shipping container and a bar to share experiences with guests and locals! The rooms have private bathroom, air conditioning, all the beds have individual locker, lamp and plugs. Guests can enjoy the common areas, pool, kitchen, living room, balcony, bar and chill out area. We can provide facilities as transfers, tours to the waterfalls, skydive, and many other possibilities to do while you stay with us. Take the bus TTU - Centro and ask to get down at Tetris Container Property (or ask for Casa container). The bus stop is just one block from the property. Take any bus to the city bus terminal (TTU). From there, change to the bus Aeroporto - Parque Nacional and ask to get down at Tetris Container Property (or ask for Casa container). The bus stop is just one block from the property. Take any bus to Foz do Iguaçu. Don´t forget to ask the bus driver to stop at the Brazilian boarder to stamp! You will probably have to wait for the next bus, and then ask to get down at Tetris Container Property (or ask for Casa container). The bus stop is just one block from the property. We also can provide tours and transfers. If you want to book it, contact us at least 24h prior to your arrival!